Ten years ago, David Lowenstein moved from New York City to Cazenovia, New York because Lowenstein and his partner wanted their eldest son, who was entering kindergarten at the time, to receive a quality education. At the same time, Cazenovia College was looking for someone to make more use of the Catherine Cummings Theatre, and create a bridge between the theatre and the local community. "It was a serendipitous moment," says Lowenstein. "Cazenovia College was looking for someone like me, and I was moving here at that time." As artist-in-residence, Lowenstein teaches a variety of courses, many of which are part of the curriculum for a minor in Theatre. Courses include Theatre History, Acting Workshop, Theatre Production, Advanced Acting Workshop, Research in the Performing Arts, Fine Arts Internship, Shakespeare, Special Topic in Dramatic Literature, and Public Speaking. 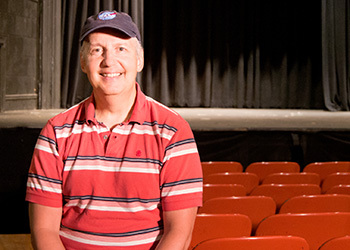 Lowenstein taught theatre for many years before coming to Cazenovia College. Throughout his time as an undergraduate student at Syracuse University, he taught dance classes at SU and Le Moyne College. Even during his performance career in New York City, he taught at Cap21 - one of the music theatre programs at New York University (NYU). As well as teaching full-time at Cazenovia College, Lowenstein also teaches musical theatre at Syracuse University, and performs, directs and choreographs at numerous places in the Central New York area including the Finger Lakes Musical Theatre Festival; Merry-Go-Round theatre in Auburn; and Syracuse Stage. Theatre-goers enjoyed Lowenstein's performance two years ago as Edna in Hairspray at Syracuse Stage. This holiday season, he will return to Syracuse Stage as Admiral Boom and the Bank Manager in Mary Poppins. Lowenstein's accomplished background in the theatre includes working with individuals such as: George Abbott, Jerome Robins, Susan Stroman, Mike Ochrent, Lynne Ahrens, Stephen Flaherty, and Allen Menken. He enjoys sharing his rich history and knowledge with his students on a daily basis. "My teaching philosophy is sharing and engaging. It is really about sharing my knowledge, and in doing that, engaging the students to share their ideas and their thoughts. I share my passion for the work that I do, because it’s been my life work," comments Lowenstein. When asked what the best thing about his job is, Lowenstein is quick to respond: "engaging with the students." At Caz, students in Lowenstein's classes come from a wide array of background and experience in theatre. Theatre courses allow them to open up their minds to the craft and the scholarly curriculum that goes into completing a theatre minor. "The stories that come to mind when I am asked of the students I am proud of are those that have never been in a show before. In our production of Arthur Millers 'The Crucible,' the gentleman playing the lead - who had the most lines in the whole show - had never been in a play before. Watching him work, working with him, and seeing the final outcome of his performance was incredible. And it was an incredible experience for him in terms of his achievement, not thinking he could ever do it. The same thing happened when we did Dracula. I really relish those moments!" shares Lowenstein. Caz students from a variety of majors, who are interested in performing, pursue the Theatre minor, which proves a nice complement and provides a useful skillset to many academic programs. Lowenstein often has students take his minor who are majoring in Communication Studies, Sport Management, and Visual Communications, among others. "If you've ever done a high school musical, one of the greatest things about doing it is the family that you make when you’re a part of the cast or part of the team that puts on the show," Lowenstein explains. "That's what happens with our classes at Cazenovia College. So to be able to see that kind of energy, and be involved in that kind of energy, is one of the best things about the classes that I teach and the shows that we do here." When Lowenstein directed his first show in the Catherine Cummings Theatre, it was a great accomplishment to present a performance that brought together Cazenovia College students and members of the local community. To be able to share a passion for the theatre with a large group of people was very heartwarming to him. Lowenstein's favorite moment is when the show opens. "It's the culmination of hours and hours, and weeks and weeks, of really hard work and the collaboration that is involved with the students, community members, and everybody that helps to put on the shows is incredible," he adds. 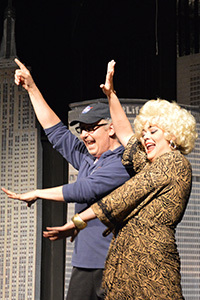 Like many of the classes at Cazenovia College, Lowenstein's theatre courses are hands-on. Students collaborate and share ideas, then put those ideas to work by building, designing and creating all aspects of the theatre productions. Students make design decisions regarding costumes and lighting, and are involved in the applications of these design decisions – something that is unique to Cazenovia College. "Cazenovia is not only a beautiful place to be, but it is a really remarkable, inviting and engaging place to spend your four years of college. There is such a diverse array of things to do, in addition to the theatre," adds Lowenstein. Learn more about Lowenstein through our Faculty Spotlight video.